What have you got in 2018, and what’s your vision in 2019? 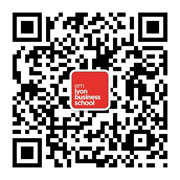 emlyon business school will usher in its annual gala soon. This year, we’ll have our “Inspire the early maker of the future” themed gala held in Beijing for the very first time. We hereby sincerely invite all our professors, students, alumni and partners to join us. Don’t hesitate! Scan the QR code now to get early bird tickets!